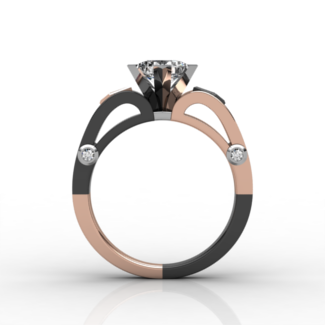 A concept ring inspired by the character Harley Quinn. 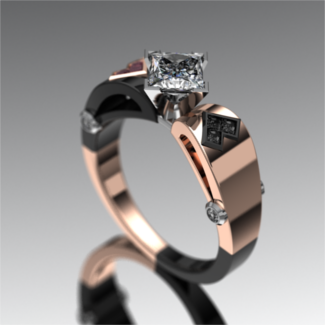 Her iconic eye mask outline can be seen from the top, her jester's hat or pigtails (depending on your choice of universe/plotline) inspired the front profile of the ring. 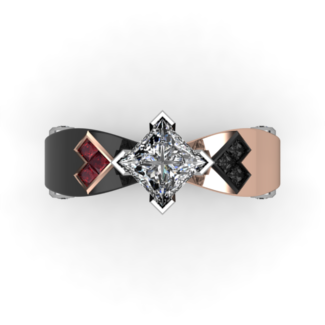 It has a Rose Gold and Black Rhodium checkerboard pattern and is set with Rubies and Black Diamonds with White Diamonds in bezels.